Before I knew this group was Norwegian and had won the Eurovision Song Contest in 1995, I had loved them - Secret Garden. Their songs are as beautiful and surreal as their name. 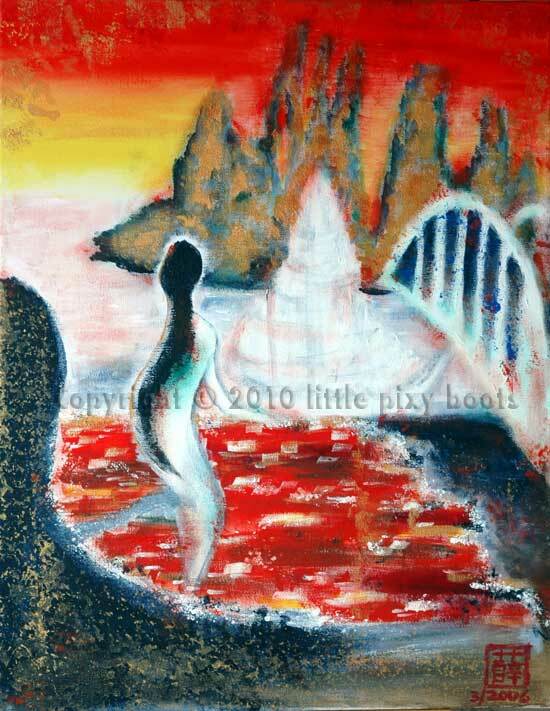 Their song Prayer reminds me of a painting I did with acrylic paint on canvas some years ago, inspired by my dream. In this city, I ran away from a shadow who had a knife in his hand. Yet I felt calm and ran to the rooftop, where I can see the Ship of Dreams leaving. How strange it is that I could feel so calm while being pursued by an unknown shadow. My angels have indeed enfolded their arms around me and the wind, whispering a soft lullaby to soothe. This song "Prayer" is one of my favourites after Nocturne (see my illustration inspired by Nocturne). It brings my soul to the City of Dreams where I feel safe even when there's a shadow hanging over me.